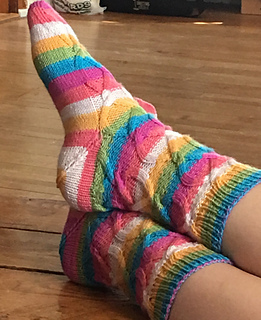 6¾ (7¼, 9)" foot circumference and 9¼ (9½, 10)" long from back of heel to tip of toe; foot length is adjustable; socks shown measure 7¼"
One of the best things about knitted socks is that they let you be adventurous with color. Brighten up your toes with a pop of color or go subdued; either way, the stunning cables on the Traveler’s Socks will attract the eye. Finished Size 6¾ (7¼, 9)“ foot circumference and 9¼ (9½, 10)” long from back of heel to tip of toe; foot length is adjustable. 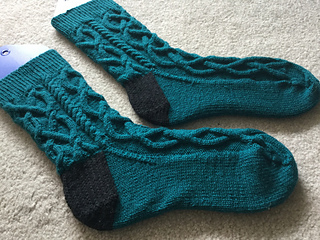 Socks shown measure 7¼“. Yarn Done Roving Yarns Frolicking Feet (100% domestic superwash merino wool; 480 yd 439 m/4 oz 113 g): #46 raspberry, 1 (1, 2) skein(s) (see Notes). Needles Size 2 (2.75 mm). Adjust needle size if necessary to obtain the correct gauge. Notions Markers (m); cable needle (cn); tapestry needle. Gauge 32 sts and 52 rnds = 4” in St st; 36 sts of Trellis Cable chart = 2½“ wide. The full magazine, with more wonderful winter patterns, can be purchased here.